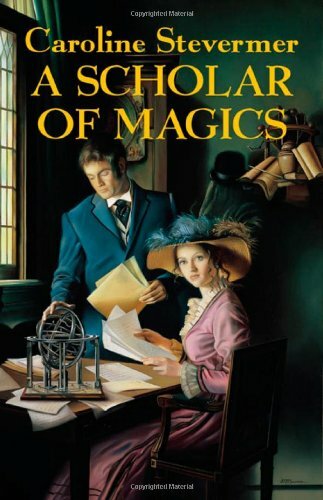 Not as perfect for me as A College of Magics... but A Scholar of Magics by Caroline Stevermer still hit me hard. I am bereft that this series is now over for me. Only three books! I need more. I have never read a book which has captured so perfectly the conflicted feelings that come from being a student at an elite institution who does not come from the expected/traditional background. This book engages somehow critically with the ways in which these instructions work while also, of course, buying into the romance, the longing you feel to be a student... and because of reasons it can’t properly engage with the fraught problems that arise once you become a student. But I don’t mind; there was plenty of that in the first book in the series, although the institution in that book is of a different kind. The model for the university in this one is Oxford or Cambridge, while in A College of Magics the model for the university (Greenlaw) is more like a girls’ boarding or finishing school. As ever, I love Stevermer’s prose and her characters. Lambert, in particular, is wonderful. And her dons, and the students, and Jane is pretty magnificent once more although she seems to slightly fade towards the end of the book... Stevermer's writing is gentle but clever, you can feel the influence of writers such as Dorothy L. Sayers without feeling that she is weighted down by them. I enjoyed here how she wrote an American protagonist in this very English world - and how she confounded a lot of my expectations of what that was going to look like. But really what captures me most in her writing is the way she writes about magic. There is truly something of the numinous here, it’s mysterious without being vague or woolly. The way Lambert walks the labyrinth, the way magic here is to do with proportion and order... it’s compared to cricket, to the way time works, to the structure of the universe. And magic can be glimpsed in song, in architecture, in maths... yes, yes, give me more of this always. I’m also obsessed with a too-brief scene which takes place in a magical forest, and the way she builds on a very effective mythology. I would have eaten up much more of that. I want more. This book works well as a standalone but it ends just as a new portion of Samuel's life begins (much as A College of Magics ends on the same sort of change for Faris), and here we don't even have the promise of a sequel with glimpses of him in. they are great! there's also a kind of prequel (set hundreds of years earlier in the same world), when the king comes home. i like that one a lot too, but it's pretty different.